But Union Workers Stand Strong! Negotiations for a new Union Contract commenced this week for Starlight employees. Next week they start for Grand Villa employees. Unfortunately, Gateway management is going after you and your rights. They are attacking you. For some period of time, Gateway management has told you that your union is not committed to negotiations. There is no doubt we were nervous about bargaining because the company has been secretive about possible changes to the business, including the fact that it might be sold. Research on the internet reveals that they have made filings with the US Securities Commission to put the business on the market. Bill Stewart, Vice President of the company, does not deny the legitimate concerns of employees in this regard but says he can’t and won’t talk about it. Even in this situation we have made every normal effort to get to the bargaining table to try to push for answers for you. At negotiations this week we were very troubled by what we heard from the company. The company proposed a new contract for Starlight employees with nothing but takeaways! This is the unaltered document that the company gave us. There are no wage increases and no benefit improvements. In fact, every single one of their proposals appears to be a takeaway. We are at a loss as to why they would attack Starlight employees after they have worked so hard to ensure a successful renovation for the facility. The news isn’t any better for Grand Villa employees. Grand Villa employees have had enormous challenges getting their casino up and running in the downtown market. As we have said before, we believe the business has been poorly managed insofar as Gateway managers have not successfully marketed the casino. This is especially true during months where there are no hockey games and few events. Sadly, hardworking employees have even lost their jobs through layoffs because of this. Negotiations have been scheduled to commence for that workplace for weeks. They were to commence next week. But before we even start bargaining the company has engaged in a manoeuvre to set the stage for a possible lockoutof the employees at the Grand Villa. Without any bargaining whatsoever, they advised us today that they were going to ask the Alberta Government for a mediation process. That sounds innocent, but labour relations experts know that avoiding the bargaining table and pushing for mediation in a circumstance like this is driving towards a possible lockout of the staff at that casino. Under Alberta law, the parties must have mediation before a lockout. We are gravely worried that the company is clearly trying to just jump through the mediation hoop so it is positioned to attack the Grand Villa staff with takeaways and rollbacks under threat of a lockout. After all, the hockey season is over and it could be their strategy to do this during their quiet time to minimize the impact on the business. Your union wants to negotiate. We do not want to fight. We told the company that. We have asked company negotiator Julia Simpson to come to a meeting to answer your questions. In fact, over 250 employees have already demanded that she attend a special meeting to answer their questions. She has not accepted our invitation. Instead she avoids issues and questions at the bargaining table. The company sends you memos that distort the truth, hiding behind a piece of paper rather than standing up in front of all of you. When union negotiators asked the company to videotape bargaining, they refused. What have they got to hide? Mr. Stewart has acted with considerably more grace, calling the union an effective and passionate representative of the employees. But at this stage, we simply don’t know who’s calling the shots. Maybe it’s Catalyst, the company that actually owns Gateway. Maybe Mr. Stewart is a decision maker, maybe he isn’t. Unfortunately, he seems to be unapologetic for the company’s memos and actions at the Labour Board. That Labour Board has recently called some of the company’s behaviour “trivial”. The good news is that Gateway employees are strong! In the picture below you will see your coworkers standing up to Gateway management. At the bargaining table they held up placards, not unlike picket signs, showing the company that many, many employees are demanding answers. Starlight employees are committed to supporting Grand Villa employees and Grand Villa employees are committed to supporting Starlight employees. The company will not divide and conquer. Union lawyers have been instructed to aggressively respond to Gateway but it is the power of the people that will make a difference here. Any attempt to lockout employees will be met by a strike vote. 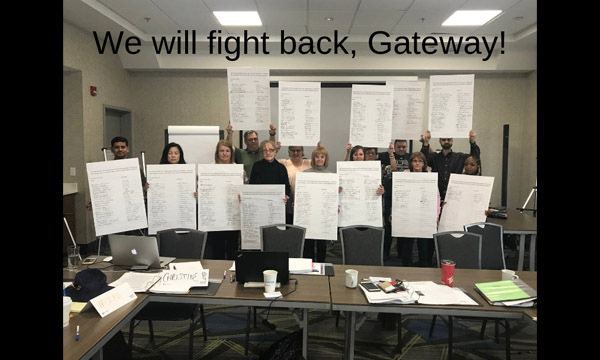 Gateway employees in BC struck their bad bosses for months in the Okanagan last year and Alberta employees are not afraid to do the same! UFCW local 401 will fight. There is nothing “trivial” about your union!